The Partagas Serie E No.2 is a powerful but creamy medium-full Robusto Extra, 5.5” (110mm) long, of 54 ring gauge, and comes in a box of 25 cigars. With its top quality tobacco flavors, it predominates the palate with notes of earth and cedar and floral aromatics. There are also lots of delicious peppery notes. The Partagas Serie E No.2 is a top Habano cigar. It is on par with BHK 52 or BHK 54. • Medium body cigar, with an amazing flavor profile marked with creamy flavors, spices, wood, coffee and nuts among others. • Perfect construction on this Robusto Extra, perfect burn, creamy smoke. A cigar for experienced smokers. 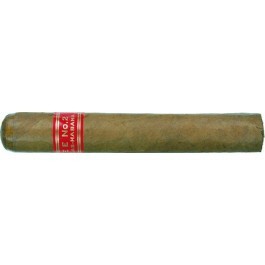 This cigar is simply one notch higher that the Partagas D No 4 in terms of flavors and strength. The Partagas Serie E No.2 is a very good looking cigar despite being large. Surprisingly, it doesn't feel that heavy in hand. The wrapper is rather smooth and oily and has a beautiful Colorado color, brown-reddish. When squeezed between finger, the cigar as just the perfect give, not too much, not too few, and there are no soft spots. On the wrapper itself, the quality of the roll is excellent, the triple cap is very well applied, almost seamlessly. There are a few veins on it, but it does alter the fact that this is one of the best ranked wrapper among Habanos. The wrapper smells of wood (cedar) and of faint chocolate. Once clipped the cap, the draw is perfect and gives aromas of wood and nuts. The Serie E No.2 catches fire easily and, while the burn line requires a couple of touch-ups to stay razor sharp, the cigar is producing a nice light grey ash. The strength picks up right from the first few draws, despite the big ring gauge. The smoke is dense, chewy and flavorful, with aromas of walnuts, hazelnuts and dry fruits. The first puffs reveal the complexity of aromas and the power of the cigar. The first third of the cigar starts off with strong flavors of wood, cedar like, there is also leather, tobacco and earthy tones. There are also some herbal notes of barnyard, no spice whatsoever, maybe just a bit on the retrohale. To bind the flavors together, a beautiful creaminess develops, along with some undertones of mocha, hints of citrus and some sweetness. The flavor profile of the first third is typical Partagas. The strength builds up right from the beginning, never overpowering, but it gets stronger towards the end of the third, reaching the medium range. In the middle third, the flavors remains similar to those presented in the first part of the cigar. The earthiness is now more present among the other flavors; the coffee/mocha notes are also more noticeable. At the same time, the creaminess increases as well, while some nuttiness also appears, in short, the aromas are getting richer and richer. The strength ramps up again, now being a strong medium cigar. In the final third, the Serie E No.2 shows its real self, that is being one of best Habanos. The flavors remain interesting, and never too harsh. The creaminess is still there, but not as strong as in the previous thirds. The main flavor is some beautiful mix of sweetness from honey and some delicate spices. The balance between those two flavors is amazing. It is joined by flavors of wood, coffee, hay. There are also some notes of dark chocolate, which makes the cigar interesting until the nub. It is a beautiful smoke, which strength remains a solid medium. In summary, this is one of the best Habanos out there. A great balance of flavors, always exciting and beautifully constructed. He flavors develop like an elegant music symphony. This cigar has all the flavor profiles that we have grown to love in Partagas. It is closer to medium than full IMHO, but will pair well with a nice Port. Will benefit greatly from a couple of years of confinement in the humidor. Disappointing never in stock why????? Love this cigar, always an addition in my humidor. In my humble opinion this is the perfect cigar, smooth and earthy with a touch of spice and always burns perfectly. Its not as sophisticated as a top end cigar but great value for what it is. The last batch I received from Cigar Terminal was, for the lack of a better word, 'Perfect'!. My only compliant is that since the embargo was lifted its getting harder and harder to come by. The Serie E No 2 is a great smoke. It's creamy smooth and burns perfectly. The box I received came in perfect condition and the serial number checked out on Habanos website. If you like cappuccino, a touch of cinnamon, creaminess surrounded by an earthiness that lasts for 70-90 minutes, you will like this cigar. I tried one in Singapore and started my search to find more, thank you Cigar Terminal! My boxes just shipped, can't wait to have them. I will age some and enjoy the rest.